New Premium Quality New Holland Replacement Starter. Computer tested for consistent reliability. 12 Volt 3.1kW 10-Tooth Pinion. 3918688, 81866002, 82005342, 82007917, 82013922, 82015723, 86628964, 89821291, F0NN11000BA. New Holland Motor Grader Diesel. RG100 5.0L 4cyl 99HP 00. RG80 4.4L 4cyl 80HP 00. HW300 4 Cyl 5.00L 305ci 98-04. HW320 4 Cyl 5.00L 305ci 98-04. HW340 6 Cyl 7.51L 458ci 98-04. HW345 6 Cyl 7.51L 458ci 04-07. HW365 6 Cyl 7.51L 458ci 04-06. New Holland Agricultural Tractor Diesel. 5610S 4 Cyl 4.41L 4414cc 269ci 94-00. 6610S 4 Cyl 5.00L 305ci 94-00. 7610S 4 Cyl 5.00L 305ci 94-00. TB100 4 Cyl 5.00L 305ci 03-07. 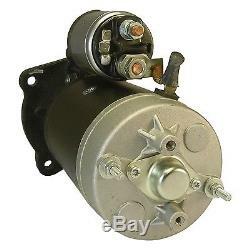 TB110 4 Cyl 5.00L 305ci 03-07. TB120 6 Cyl 6.62L 6621cc 404ci 03-07. TB80 4 Cyl 5.00L 305ci 03-07. TB90 4 Cyl 5.00L 305ci 03-07. New Holland Tractor - Compact. TB85 4392cc NH Turbo Dsl 03-2010. Power: 3.1kW / 4.15HP. Gear OD: 1.535in / 39mm. Mtg Ear 1 Hole: 11.3mm Unthreaded. Mtg Ear 2 Hole: 11.3mm Unthreaded. Mtg Ear 3 Hole: 11.3mm Unthreaded. Terms and Conditions - Contact Information. Please inspect your product immediately upon receiving it. Please use care in packaging return merchandise. All our Alternators and Starters when properly installed, are warranted against defects in materials and workmanship to the original purchaser for a period of one (1) year. The sole responsibility of AJ-Electric if any; shall be the repair or replacement of defective products as stated above. It is the responsibility of the customer to verify the correct application information prior to purchasing any product from AJ-Electric. This at times may result in slight appearance differences. Please be assured that this item will fit and function perfectly. The item "NEW HOLLAND STARTER FITS LOADER MOTOR GRADER WINDROWER LB75 LB90 LB95 LB110-115" is in sale since Wednesday, June 28, 2017. This item is in the category "Business & Industrial\Heavy Equipment, Parts & Attachments\Heavy Equipment Parts & Accessories\Tractor Parts". The seller is "aj-electrial" and is located in Franklin, North Carolina. This item can be shipped to United States.